In the previous issue, having been sprung from jail by his fiancee Mera, Aquaman makes a break for the water in an attempt to stop a war from being started between the United States military and Atlantis. Between him and his goal, however, is a large group of soldiers, tanks and helicopters who want to keep him detained as a possible terrorist. Aquaman along with Mera manage to break through the wall of soldiers, using non-lethal force, and the water is practically in sight when suddenly they are stopped by Superman. Meanwhile, in Antarctica, Black Manta comes face to face with the leader of N.E.M.O., the Fisher King. This issue follows directly after Superman's arrival, with him attempting to talk down Aquaman from any more violence and destruction and asks him to turn himself back in. 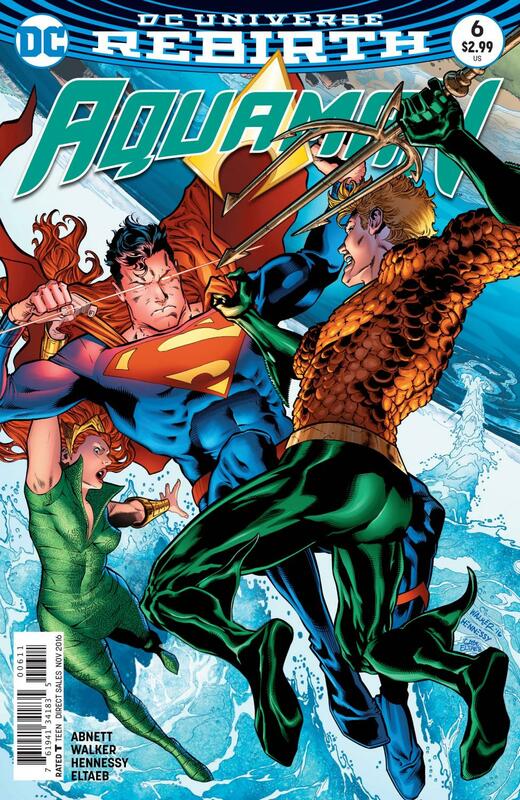 Seeing that Superman will not allow him to proceed, and still fearing the Atlanteans attacking in retaliation for their king being taken prisoner, Aquaman begins to attack Superman, Mera jumping in to help him. The fight rages on with Aquaman clearly taking a beating while fighting on anyway, lamenting about his role as an outsider in the Justice League and the fact that no one seems to respect or even really like him. The fight ends as the Atlantean military arrives, ready to do war with the surface world before being stopped by Aquaman. Superman allows Aquaman to leave, telling him that he needs to fix the situation, or else. In Antarctica, Black Manta kills the Fisher King, taking his role as the new leader of N.E.M.O. Overall, I wasn't a big fan of this issue. Aquaman's ranting about how he doesn't fit in with the rest of the League and is always viewed as an outsider essentially just feels like a re-hash of his early New-52 and even earlier Rebirth stuff, where they regularly had him lamenting how no one seems to understand him and everyone views him as a joke. This instance specifically came off as a bit whiny, and the series really needs to move on from it for a bit. The artwork is fairly hit and miss. The deterioration of Aquaman's costume over the course of his fight with Superman, along with his face and body slowly becoming bloodier and bruised is a great touch, and a wonderful counterpoint to Superman, who remains relatively untouched during the fight. In contrast, the pose that Aquaman strikes when hitting Superman for the first time, while dynamic, defies the laws of physics and biology. Some faces look awkward, and some of the panels flow oddly from one to another, but otherwise it is serviceable. Overall, I wasn't thrilled with this issue. While the issues being tackled during the fight could be compelling, they really just come across as Aquaman whining about things that we've heard before. I enjoyed seeing Arthur and Mera working together to take on a stronger opponent, both giving the other a chance to breathe as they fought, but the dynamic simply wasn't enough to offset the tone of Aquaman's complaints. Hopefully in the future, when this is inevitably brought up again, the argument has a bit more nuance, because otherwise it is getting old really fast.